Thoughts have power. They shape our character. They shape our existence. They shape the nature of our being. No wonder we’re encouraged to watch our thoughts, guard them, and direct them for good. We sometimes picture our minds as being storage spaces, and that we’re constantly sifting through files, gathering, grouping, and organizing information into something that will benefit us in a practical way. I don’t see thoughts that way at all. Thoughts have no boundaries. They’re not limited by space, time, or possibility. They are like an energy cloud of infinite space and potential. They can create, reform, and change the course of universes. They influence everything, because everything we see is from the paradigm of our thoughts. And we, in physical form, effect the things we see. But, some may argue, you can’t effect someone on the other side of the world just by thinking about them. I disagree. You most certainly can. Think about that person enough, with real depth, and you’ll reach a point where you can’t not act out physically on your thoughts. Those thoughts leak out in your actions, words, and eyes, and in your interactions with other people. You are the embodiment of your thoughts. You can change yourself by your thoughts. You can change the world with your thoughts. The more you think on a thing, the more that thing comes into being. Eventually, things happen to effect that one person on the other side of the world. That’s the power of thought. Thoughts determine choices, and choices change the world. Given enough time and attention, a single thought can alter the course of the world. How much more effective then, is your thought of the creator of everything you’ve ever seen. Jesus Christ is a man—a perfect, resurrected, omnipotent, and powerful man, but He is a man. He has thoughts, and His thoughts govern the universe. And if you, also a human being, think on that eternal being, and connect with Him, your influence over the universe expands beyond anything you might think on your own. The very thought of the Savior, who both created and bought the universe, empowers you to do so much more than you could otherwise do. You may long for his presence. You may picture His face, the very embodiment of eternity. You may think of His life, His choices, His sacrifice. 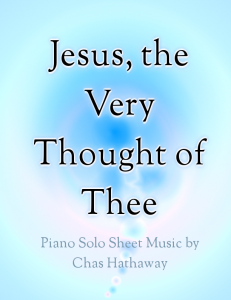 You may think of His perfection, atonement, and His eternal glory. You may think of your own experiences with Him. You may think of Him daily. But whatever you do, think of Him. The very thought of the Savior has power to shape the universe, for you, for your loved ones, and for the whole human race, now and forever.